. يقدم Wailoaloa Beach Resort خدمات لا غبار عليها وكل أشكال اللياقة وحسن الضيافة اللازمة لإسعاد ضيوفه. لضمان راحة ضيوفه، يقدم الفندق الخدمات التالية: مكتب الاستقبال على مدار الساعة, مرافق مخصصة لذوي الاحتياجات الخاصة, تخزين الأمتعة, خدمة صف السيارات, صف السيارات . ادخل إلى واحدة من الغرف 62 وتخلص من عناء نهار طويل بمساعدة مجموعة كبيرة من الخدمات كمثل تلفزيون بشاشة مسطحة, بياضات, مرآة, مناشف, إغلاق الموجودة في بعض الغرف. يمكنك طلب اللائحة الكاملة للخدمات في الفندق ومن بينها مركز للياقة البدنية, مسار جولف - ضمن 3 كم, حمام سباحة خارجي, حمام سباحة داخلي, غوص. إن Wailoaloa Beach Resort هو مكان مثالي للمسافرين الذين يتطلعون إلى الراحة والاستجمام في نادي. The rooms I had been given had cockroaches running in the room , on the bed, in the wash room Later we were moved to another room which looked a bit clean but later in the night I could see cockroaches there as well, my husband tried to clean the bed as much as he could but we both couldn’t sleep all night as some thing was biting us and when I woke up I was bitten up so badly that I had to go to the pharmacy to calm my rashes , my husband was very upset so he booked another hotel and moved out.i would never book this hotel ever again. I just wasted my money there. Very very disappointed . Wailoaloa was our first stop upon arriving in fiji. The staff were great and very helpful. Our room had aircon and with this heat that was great. Really enjoyed our stay. Only downfall is the WIFI doesn’t reach all the way to our rooms. Only in the reception area. So we had to go back and forth to connect. But overall would stay here again. Booked this for my sister and her husband. I made a mistake with the arrival dates but the resort was supportive and was able to change the dates. Only minor issue was it would be great if they had kettle and tea/coffee available. everything else was great. Advantages: low room rate when ordering through Agoda.com. When ordering through the hotel reception, the price is 2 times higher. Breakfast and transfer to and from the airport is included in the room rate. The room is clean, rooms have only a bar of soap and toilet paper among bath accessories, also have bed linen. There are no towels in the rooms, you need to ask at the reception yourself. Some rooms have air conditioning, some rooms have fans. Pleasant territory of the hotel, there is a pool, a lot of tables and chairs, where you can relax. There is a pool table, bar, souvenir shop, free parking on site. The entrance is free, there is no security and barrier. From the hotel to the airport 15 minutes to drive. Disadvantages: poor choice of food for breakfast. Reception staff is forgetful. In the evening I said that I needed a transfer to the airport tomorrow morning. She forgot. In the morning I recalled. If I hadn't reminded her, I would be late for the airport. The attitude of the reception staff was not very nice and welcoming. When I checked in, the reception staff seemed not to expect my booking, so it took a little while. But the most disappointed thing was that I booked here because I wanted an airport transfer as my flight was 8am next day. But then, they said the driver would be started at 8am in the morning and they didn't answer how could I get to airport. After dinner, I asked them again how could I go to airport, the reception staff said they would arrange it and said lets see tomorrow. The next day, I asked again, the reception staff is nicer, but she said no one told their driver to come early yesterday so now the driver could only come after 7am. So I asked them if I could get taxi by their cost. The reception didn't say anything to me but she would call taxi for me. Although I got the transfer, I needed to ask a few times. The location is not closed to the beach. The room is very spacious and has nice shower. We were happy the hotel let us check in super early. The bed was comfortable and the room was huge. However the floor was really greasy and sticky? The location is 5 mins drive from the airport and there is not much else around restaurant or convenience store wise so keep in mind you may need to get a taxi if you want to go out to eat or buy food. we booked through agoda and checkin time stated was 11am. the hotel was not ready for check in at 11am. that was the only problem. however the studio villa is great with a rice cooker, frying pan and utensils. Very good place for stay nearby airport. For 35 USD Could not ask for more. However, bit of cleanliness was washrooms....removal of greasy substance from Tile of the room and a cleaner pool would be very considerable change. Breakfast is okayish...nothing porsche. Booked for 3 people so expected 3 towels atleast and 3 sets of soap and shampoos....this wasnt made availble. Towel was given upon request. Blanket is as thin as a handkerchief material bedsheet, might consider taking your own. Great place to just chill out and relax, although if the noise of planes would irritate you, then this is not the place for you, as it is situated next to the Airport. We enjoyed watching them take off and land. The breakfast was adequate, the pool was lovely and we ate there every night and the food was great value and tasted lovely. You get what you pay for in this Hotel. large rooms that were ok but a bit outdated. we were missing clean towels on arrival but that was rectified shortly afterwards . breakfast was great. 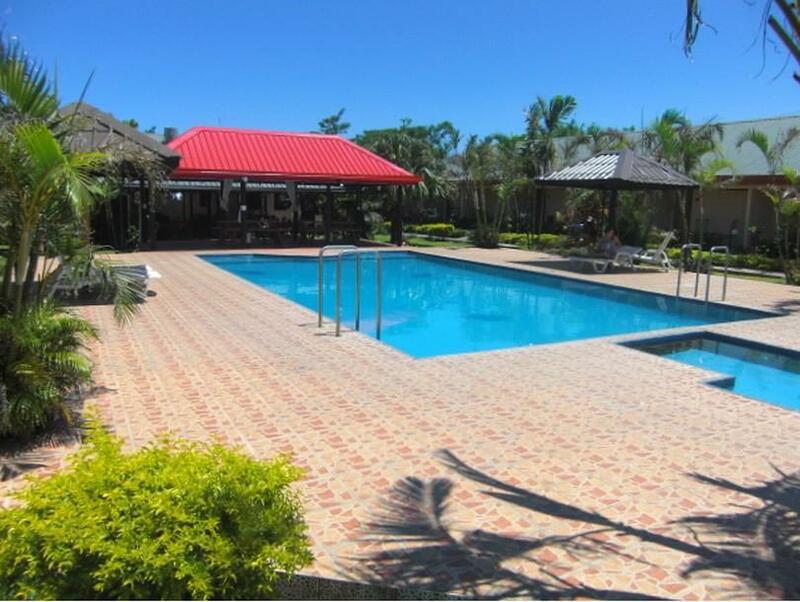 location is a short bus ride away from downtown Nadi. staff seemed uninformed about simple matters-such as how long it'll take to get to Natadola Beach, and couldn't recommend a taxi company. although they advertise that they have Wi-Fi, it is only in the lobby and horribly slow. this really needs to be changed. Friendly staff, although had to go to reception twice because of faulty door lock and missing card which won't let the electricity work in the room. Small pool with bugs. Shower did not have soap. But room was nice and spacious and clean.